During a news conference Monday, the president told the ABC News reporter, "I know you're not thinking. You never do." The White House on Tuesday corrected its official record of President Donald Trump's Monday news conference to include his insult of a female reporter. 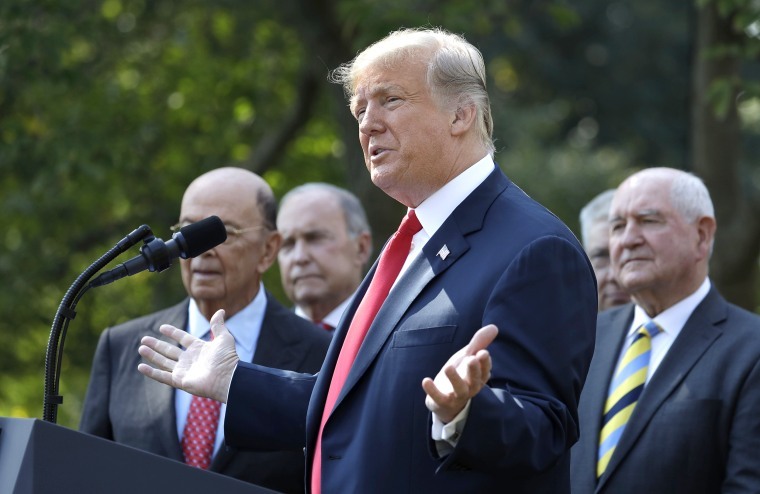 Trump made the remark after calling on ABC News reporter Cecilia Vega during the question and answer portion of a Rose Garden event touting a new trade deal between the U.S., Mexico, and Canada. Vega thanked the president for calling on her, and Trump said, "That's okay. I know you're not thinking. You never do." The exchange was quickly noticed on Twitter, and many criticized the president for the dig. However, when the White House released its official transcript late Monday, Trump was quoted as saying, "That's okay. I know you're not thanking. You never do." The misquote was quickly noted in a tweet by Voice of America reporter Steve Herman. Tuesday morning, the White House revised that portion of the official transcript to reflect that Trump said "thinking." Vega tweeted after the news conference to criticize the president for not taking her question, which was related to the FBI investigation into the sexual misconduct allegations against Supreme Court nominee Brett Kavanaugh. The president refused to answer, saying he would only answer questions on trade at that time. "A news conference means you get to ask whatever question you want to ask. #FirstAmendment," Vega said on Twitter on Monday.